Chicago’s Frederick C. Robie House underwent an expansive $11 million restoration helmed by its preservation steward, the Frank Lloyd Wright Trust. 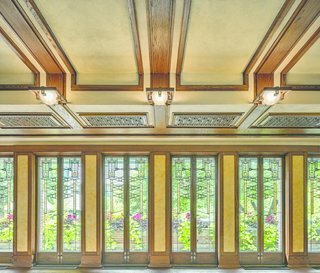 Following a painstaking, multimillion-dollar restoration, a Frank Lloyd Wright masterpiece has been restored to its former glory and reopened to the public with newly expanded tour offerings. "The windows in Robie House are the most complex of [Wright’s] leaded glass designs," says Celeste Adams, president of the Frank Lloyd Wright Trust. The Frederick C. Robie House, widely considered to be the epitome of Prairie style, was completed in 1910 as a private residence near the University of Chicago’s Hyde Park campus. The restoration team used Wright’s original drawings to help recreat the front door. 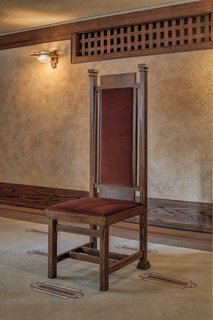 Original Wright furniture is on display in the home’s dining room, main floor guest room, and third floor. Renewing Wright’s vision after more than a century of wear and tear wasn’t easy; much has changed in materials and techniques. An extensive list of skilled preservationists, contractors, and architects conducted research for more than a year before beginning work. Original Wright drawings were key in recreating the leaded-glass front door that was destroyed in a student demonstration the 1960s. Light fixtures were reproduced and mounted next to salvageable originals. Thin layers of lime-putty, applied at timed intervals, seamlessly blended old and new wall plaster. 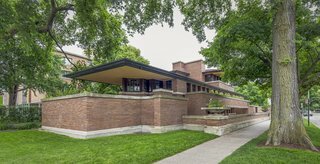 A new, 30-minute tour of the exterior of Robie House is offered in eight languages and covers the history of the home and surrounding buildings. Additionally, several pieces of original furniture, including the home’s dining table and chairs as well as the main floor‘s guest room furniture, are newly on display as part of a loan from the Smart Museum of Art at the University of Chicago. "This is a house that’s on the cusp of modernism. It’s the beginning of the open plan house," says Adams of Robie House’s architectural significance. In all, restoration work involved the dining room, entry hall, main stairway, billiard room, children’s playroom, living room and guest bedroom. "The refinement of the interior contributes to the impact you get of the sheer beauty of the house, the purity of design," says Adams. "It certainly is a moment for us to celebrate, but a moment that we also realize we have completed a phase of work that is very important," says Celeste Adams, president and CEO of the Frank Lloyd Wright Trust. "Now we will look to the future and continued maintenance and continuing to preserve this great jewel of American architecture for generations to come." 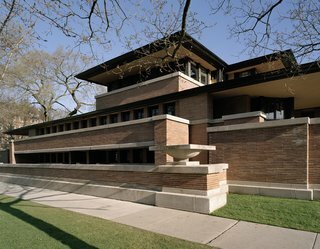 Visitors can discover Robie House and learn about neighboring buildings during a new, 30-minute guided audio tour of the exterior. Expanded 50- and 90-minute tours that include the interior of the home are also available.